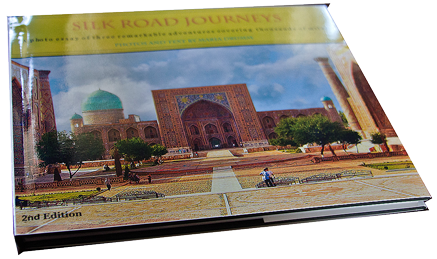 Maria’s book, Silk Road Journeys has been ten years in the making and contains 171 photographs and 10 maps. Her amazing story of Silk Road Journeys takes you into 1,000 year-old Buddhist caves in western China and India, across the Taklamakan Desert and over the Pamir Mountains into Uzbekistan. You will travel the maritime route which became important from the sixth century as trading units tried to cut out the middle man. Follow the Dhow along the Nile, stop at Petra and join a caravan or continue on to Sri Lanka and then to the great Indian port of Mamallapuram to the site of the five chariots. Your travels will also take you to Myanmar, Cambodia and Vietnam. Contact Maria for lectures on the Silk Road or any of the other countries listed on Travel page. Off to explore Israel and the West Bank. Copyright © 2019 Maria Drumm | Designed and Maintained by Baltimore Web Design. The contents (information and images) on this page may not be reproduced or republished without permission.